Indigenous Trees You Can Plant to Celebrate America | Mr. Tree, Inc.
How are you going to celebrate America on the Fourth of July? While we’re sure that many of you will fire up the grill and take the kids to the pool, nature lovers will know that this holiday weekend could also be the perfect time to do a little gardening. And we aren’t just talking about flower beds and topiaries. The home gardeners should not neglect to plant an array of aesthetically pleasing trees. Trees not only make your home look more substantial, but they also support the plant life that grows around them. And the perfect way to both expand the foliage of your yard and celebrate the birth of America might be by choosing from the many trees that are indigenous to our land. According to Audobon, native plant life can better serve the ecosystem that they’re grown in and “once established, native plants generally require little maintenance”; a win-win for homeowners who are looking to plant indigenous trees. We’ve created a list of our favorite indigenous trees that will really make any house shine. Known for the best tree care in Portland Oregon, we’re the experts when it comes to trees, so take a look and consider adding one of these to your landscape. The red alder tree is a deciduous big leaf tree and is one of the largest species of alder in North America. For the bird lover, pine siskin and redpoll eat the seeds of red alders and the growth is relatively low maintenance. Red Alder is also an excellent soil enricher. Plant your red alder seeds in full sun and prune for structure when it’s still young. Cascaras have simple, oval-shaped leaves and are perfect for small yards. Cascara can be described as both a small tree or a large bush, though some have been known to grow as high as 30 feet. Cascara can provide excellent shade for an exposed yard and bloom small greenish-white flowers come May. The flowers sprout berries, which are perfect for birds. Beautiful in the fall, Pacific Dogwoods have deep green leaves with an oval shape and are found in partly shaded places. They are what is known as understory trees. When the Pacific Dogwood flowers, its blooms are tiny. If you want your Pacific Dogwood to thrive, find a shady spot where the tree’s trunk will be shaded from the sun. And while this tree is mostly low-maintenance, you will need to regularly rake the leaves around the Pacific Dogwood to prevent anthracnose. Wildlife love Pacific Dogwoods and sapsuckers, woodpeckers, white-crowned sparrow, and other birds use these trees for both food and shelter. Pine trees are both aromatic and festive come winter. The Willamette Valley Ponderosa is best for a home with lots of land, seeing as how these mature trees can grow as high as 150 feet or more. A Willamette Valley Ponderosa Pine needs plenty of weed-free space to grow to a two to three feet radius within its first three years. Drought-resistant and best suited for well-drained soil, a Willamette Valley Ponderosa Pine can be a beautiful addition to any yard. However, if you’re unsure about your tree care Portland Oregon, a local tree service can better explain the pros and cons of this plant. 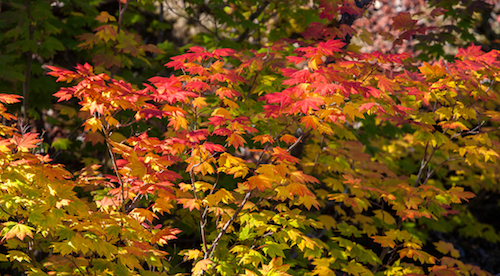 The Vine Maple is a small deciduous tree that really does shine in the fall. Though a Vine Maple might not be as tall as some of the other trees on this list, it can grow quickly to a height of 10-15 feet. These are the perfect trees for gardeners who want a little more artistry on their lawns. Vine Maples have malleable trunks that can be bent into pleasing shapes or trained as a tree with a single trunk. Vine Maples are particularly hearty, requiring little water, but need shade to really thrive. A Vine Maple does not do well in extreme heat, so keep that in mind come summer. The Oregon Crabapple is a good choice for a medium-sized yard. The Oregon Crabapple has fragrant blossoms in spring and the fruit from this tree could bring finches and cedar waxwings to your yard. The best place to plant an Oregon Crabapple is in a wet area with clay soil. The Pacific Madrone has beautiful glossy leaves that bloom to white flowers with red fruit; they are stunners once the flowers blossom. Pacific Madrone is also known for its cinnamon-colored bark and are a landscape enthusiasts dream. Plant these trees in partial sun with well-drained soil, but keep in mind that they can’t be transferred. So pick a spot to plant them that you can really commit to. While the name is sweet, the fruit that the Bitter Cherry tree bears is not for humans to eat. A Bitter Cherry tree may grow as tall as 30 feet, or stay small and shrub-like. The flowers these trees bloom are white and aromatically pleasing. Each flower has an almost almond-like scent. These trees thrive in sunny spots that have moist soil. Now that we’ve given you many indigenous tree options to plant near your home, which one will you choose? At Mr. Tree, we are the best in tree care Portland Oregon and are happy to help you decide what to plant on your lawn. Our tree care professionals have both technical knowledge and an artistic eye, so why not give us a call for a consultation? Whether you need a tree removed, pruned, trimmed, or shaped, our professional arborists will be happy to take care of all your tree care needs.